Moses goes up Mount Sinai to receive the two tablets of commandments. He is to stay there and learn for 40 days. The Israelites miscalculated and thought that Moses was taking too long a time to come down from the mountain. They gathered around Aaron and said to him, Make us an oracle to lead us. We have no idea what happened to Moses, the man who brought us out of Egypt. The sin of the golden calf was considered a very grave sin. Hashem was with anger and wrath and Moses pleaded with Hashem not to destroy the Israelites. (Exodus 32:11). 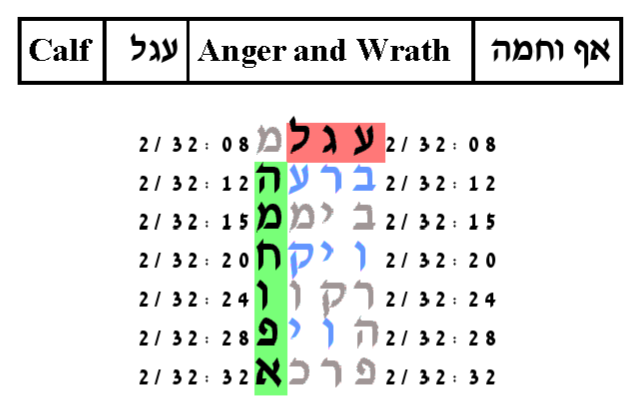 We first pair the keywords Calf with Anger and Wrath and obtain the smallest area table in the Torah as shown below. The probability that a monkey text in the ELS random placement text population would have as small a table as this one is 244/10,000. The expected number of ELSs is set to 10. The resulting table is on a cylinder size of 238 columns. The probability that a monkey text in the ELS random placement text population would have as small a table as this one is 244/10,000. The verse in which the skip 1 ELS for calf appears is the verse about the Golden Calf. It is interesting that two verses later the Torah speaks directly about Hashem's anger. This is an instance of a phenomenon where a verse near the ELS has a word that is the same as a word in the ELS.